Did you know you can clean your home with natural ingredients you have in your home? It’s true! As local house cleaners in Colorado Springs, Maid to Shine is proud to use natural cleaning supplies that are safe for you and good for the environment. For everyday house cleaning, think twice about using strong cleansers containing bleach and harsh chemicals. Consider these three common ingredients to keep your house clean and smelling fresh! Vinegar wipes out soap scum and tarnishes while keeping molds, mildew, and bacteria at bay. This non-toxic wonder has so many uses you’ll be buying it by the gallon. Use vinegar to clean your coffee maker by brewing a cycle with vinegar. Follow by running several cycles of clean water to wash the vinegar out. Messy drains? Pour vinegar down your drain and let set for 30 minutes. Rinse with cold water to clean out your pipes. Remove your showerhead and soak in vinegar overnight to clean mineral deposits. Or, fill a plastic bag with vinegar and tie over the neck of your showerhead to soak overnight. Lemon is another acidic agent that’s great for removing stains and dirt. Just be careful – it has natural bleaching qualities! Keep a couple lemons on hand at all times for personal and cleaning use. Food stains can be hard to remove. Squeeze half of a lemon onto a cutting board and rub in to remove stains. Let sit for 20-30 minutes, then rinse. Grout attracts the deepest, darkest messes. To rid your counters of grout stains, combine lemon juice with 1-2 teaspoons cream of tartar. Use a toothbrush to apply the paste and rinse when finished. If your faucets are accumulating lime deposits, rub lemon juice on them and let it sit overnight. Use a damp cloth to wipe clean. Baking soda is the wonder ingredient that absorbs odors and removes stubborn stains and grease. Any time you have strong odors or grease, you’ll want to keep this on hand. Do you battle dark rings around your coffee or tea mugs? Remove dark stains on mugs with 2 parts water to 1 part baking soda and allow to soak overnight. Scrub the mugs in the morning and rinse. Do you have stubborn odors on furniture or in your carpet? 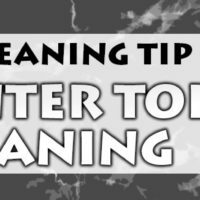 Sprinkle baking soda on your furniture or carpet and remove by vacuuming. Say goodbye to foul smelling odors. If you avoid looking underneath the hood of your stove, you might want to sneak a peak. When you do, thank goodness for baking soda and hot water to the rescue! It removes even the toughest grease. Try out these natural cleaners next time you clean your home. If you need reinforcements, Maid to Shine is here to help. We’re the local house cleaners in Colorado Springs and we’re ready to accept any challenge. Contact us today to schedule an appointment! I liked all these tips, I’d heard of some of these like vinegar but I’ve never used or heard of lemons being used that way, I’ll try that out! i found the lemon so helpful. its kind of tricky if you forget it on the stain because it could bleach the color. but usually the lemon saves the day. I love the idea that I can buy natural items at the grocery store and use them as a cleaning agent. The best part is that each of them are usually on my shopping list anyway. I’ll be sure to consistently add them on my list twice. How well would baking soda or vinegar work on my plumbing? Great tips! All 3 of those are fantastic natural cleaning assists. The Baking soda is great in kitchens. Would definitely recommend this to any consumer. I didn’t know that lemon could be used to help clean cutting boards! I usually just run mine through the dishwasher, but sometimes even that doesn’t produce the results I want. I’ll have to add lemon to baking soda and vinegar for my natural house-cleaning kit. Thanks for the advice!